The International ECSA Conference is a biannual event organised by the European Citizen Science Organisation (ECSA). This year’s event took place on 4 and 5 June in Geneva and was focussed on “the citizen”. 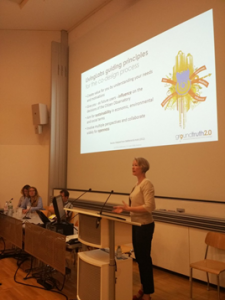 Ground Truth 2.0 not only ensured its presence in the conference, but also in the ECSA General Assembly, and in the launch workshops for the WeObserve Communities of Practice. This year’s ECSA Conference brought together a wide variety of researchers, academics, public authorities, private companies and civil society organisations from all over the world. It was in this dynamic setting that Project Director Uta Wehn (IHE Delft) presented Ground Truth 2.0 in a parallel session on “Observatories”. She argued that in order to achieve their desired societal outcomes, citizen observatories rely on the careful combination of social dimensions and enabling technologies. In line with the Living Lab guiding principles for the co-design process, it is crucial to understand the needs and motivations of citizens and to involve citizens at every step of the way. There was much interest in the Ground Truth 2.0 methodology from the audience. Ground Truth 2.0 partners CREAF, Earthwatch and IHE Delft took part in the launch workshops for the CoPs. 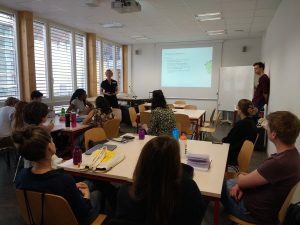 These workshops were organised as part of the Citizen Science Workshop Day on 6 June 2018 at the University of Geneva. The launch workshops were a great opportunity for the partners to connect to new people and organisations, to co-define the objectives of the CoPs, and to further specify the topics of each CoP. For more information on the launch of the CoPs and how you can get involved, you can go here. For direct registration for one of the CoPs, please complete this form.